You’ve probably watched the SUPERBOWL on television, heard stories about SUPER HEROES with SUPER POWERS like SUPERMAN, but have you ever eaten SUPERFOODS? 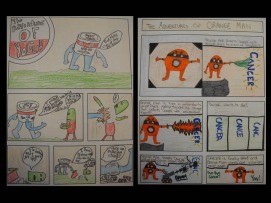 This lesson and activities exposes students to very common SUPERFOODS, explores why they are so important for us to incorporate into our daily diet and uses a comic strip project to encourage others to eat them as well. What makes superfood super and junk foods junk? View the YouTube clip “Why Junk Food is Junk and Superfoods Super?” Have students complete the guide sheet while viewing and then review answers. Discuss what superfoods do for our bodies and then using a document camera, show a list of common superfoods. Ask students to choose five of their favorite superfoods to learn more about. Use the laptops to learn more about chosen superfoods and complete the assignment sheet. Choose a favorite superfood to create a comic strip geared towards young children to encourage them to eat this superfood as well as explain what this food could do for them nutritionally. I give at least 2 days for students to brainstorm and sketch a storyline, proof read and edit before adding permanent color. Excellent!! I will try this with my kids! This is exactly what I wanted my students to do but I did a quick Google search first. Thank you for all of the work you did making this high quality lesson and thank you for making it free for us. Thank you so much for this!!! It's perfect.